A Volkswagen van, Elon reportedly ripping into the UAW, bicycles, and how your emissions regulation sausage is made. This is The Morning Shift for September 25, 2018. “Level 4" autonomy, for those following along, is the capability of the car to drive around autonomously, if there’s a person there to take over just in case, and if the weather is nice, and if Venus is in retrograde, and if you’re not in a major urban zone where these vans will primarily operate. Autonomous cars will never happen though, so don’t worry about that. What you should be concerned with is this little electric van! As we noted a few days back, it looks extremely good and we’re big fans already. 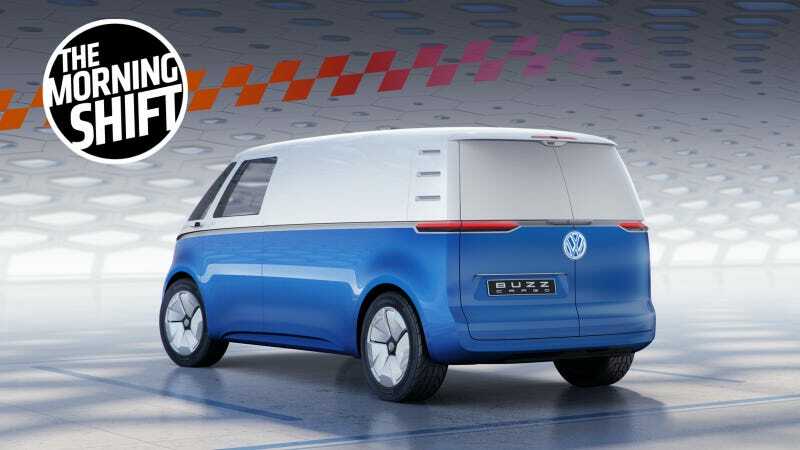 There are no real dedicated mass-market electric-platform panel vans on the market yet, and this isn’t just “a step” in the right direction, it is the right direction. For small city-bound panel vans, that is. No one is out here singing the praises of the engine in a Ford Transit Connect or whatever. We were first clued into the expected production date by Automotive News, and while this might not be life-changing for those in the industry, I decided to make it the lead story today because it makes me happy and, you know what? Sometimes we all need a little happiness in life. It’s just good for everyone. 2nd Gear: Did You Know Elon Doesn’t Like The UAW? Tesla and its CEO, Elon Musk, have gotten into plenty of hot water over plenty of things, but one of the things its gotten into especially hot water over is the issue of unionization. The National Labor Relations Board, an American government agency tasked with enforcing labor law, has already ruled that Musk and Tesla violated the law when Musk tweeted that employees could “give up stock options” if they unionized. There’s also been a bunch of other weird things going on, like the UAW saying Tesla has “interrogated” employees over their unionization efforts, and the UAW claiming that Tesla has engaged in mass-firing specifically to hurt unionization efforts. Now, before we continue, let me just make the mandatory note that the UAW has a dog in this fight, and it’s got a long history of being not-quite-above-board itself. But! That doesn’t mean the UAW isn’t correct. Just something to bear in mind. A Tesla spokesperson told Bloomberg that all of the allegations were “false,” which, okay. Regardless, these are all absurd anti-union arguments. The only real way for workers to have a voice is to have a union. The union is made up of the workers. Paying union dues is never a problem because the union always gets you more than enough money to cover the dues, that’s the whole point. And companies don’t “give” workers a union, workers give themselves a union. If this all sounds like a lot of paternalistic hooey to you, you are correct. Attack the UAW for having a history of corruption, sure. But everything else is just silly. The Trump administration desperately wants to roll back vital emissions regulations, but as much as President Trump wants to, he can’t just snap his fingers and then they’re gone. There’s a whole process involved. A big part of the process is holding public hearings about its dumb and bad plans, and though real input from the public encompassing massive and overwhelming opposition to its ideas has never stopped the Trump administration before, it still wants to game the system as much as possible. To test how Americans feel about its plan for rolling back car and truck pollution standards, the Trump administration kicked off an initial public hearing on Monday in Fresno, California, a place where it might reasonably expect a friendly response. Fresno lies in the Central Valley, California’s farm belt, where people drive pickups more out of necessity than fashion and where, according to the California New Car Dealers Association, the share of zero-emission and hybrid new-vehicle sales account for less than half what they do in San Francisco. Fresno is also represented in Washington by Congressman Devin Nunes, a Donald Trump loyalist who once described climate change as nonsense. If you want something to go your way, make sure that you do everything you think is possible for it to go your way. California Attorney General Xavier Becerra and California Air Resources Board chairwoman Mary Nichols were among several state officials on the first panel to testify. Nichols said the administration’s claims that the rollback would improve safety were absurd. Becerra said California could not afford to retreat in the fight against climate change, noting the wildfires that have ravaged the state over the last several years. “My message to the federal government: ‘Do your job. Withdraw this proposal,’” Becerra said. The audience applauded Becerra and Nichols’ comments. This is all stupid and dumb and unnecessary fight. Everyone, including automakers, already agreed to these rules. This whole dumb process also costs taxpayers money. Stop wasting it. I have long maintained that bicycles are fine as a way to waste a day and get some exercise, but for real transportation they could be improved if they had two more tires and were surrounded by thousands of pounds of steel and all of that is really heavy so they should probably have an engine, too. Because cars are better. It all adds up to a damning indictment of Florida drivers more than anything else. Texting while driving and driving under the influence don’t help, either. Nor does it help that most of Florida’s development has been since World War II, when big suburbs were created that heavily favored cars to the detriment of other forms of transportation. But that’s sort of what needs to happen. It’s four-time Le Mans winner Henri Pescarolo’s birthday. Neat. Neutral: How Will You Spec Out Your Futuristic Panel Van? You can’t take shag carpeting. It’s my idea! I’ve already claimed it!